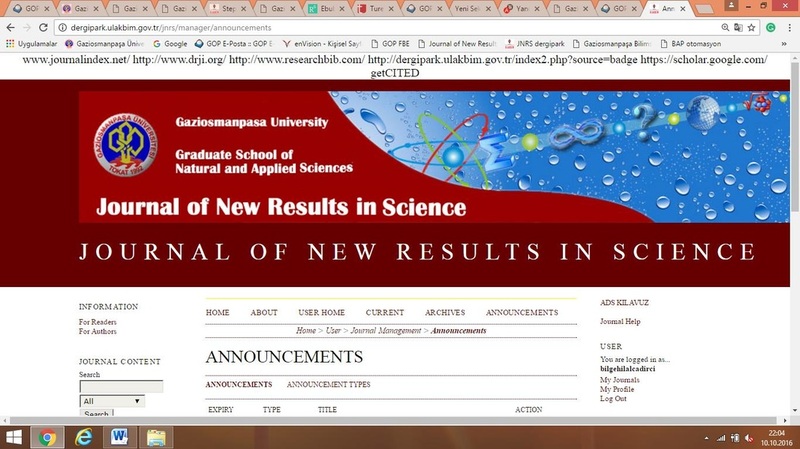 Journal of New Results in Science (JNRS) is an official journal of Gaziosmanpasa University, Graduate School of Natural and Applied Sciences. Journal of New Results in Science (JNRS) has started its publication life on 01/02/2012. Journal of New Results in Science (JNRS) is an international peer-reviewed journal. The journal publishes the original English research articles and reviews in life sciences. The journal has open access system. Journal has the online journal management and tracking system. Journal of New Results in Science aims to publish on life science (theoretical, experimental and technical research on life sciences). Journal of New Results in Science (JNRS) has published as two issues in a year. From 2017, third issues will be published in JNRS. JNRS have rapid manuscript publication and peer review process with online manuscript submission system, quick access to your research results to global audience with open access system. JNRS has published as online manuscript submission and tracking system. There are no page charges for manuscript publishing. Journal of New Results in Science (JNRS) is indexed/abstracted in GOOGLE SCHOLAR, RESEARCHBIB ACADEMİC RESEARCH INDEX, DİRECTORY RESEARCH JOURNALS INDEXING(DRJI), JOUR INFORMATICS, PUBLONS, ELECTRONIC JOURNALS LİBRARY, INTERNATIONAL INNOVATIVE JOURNAL IMPACT FACTOR (IIJIF), GLOBAL IMPACT FACTOR, JOURNAL INDEX.